A marmite situation has now begun - after the success of The Jungle Book last year among other things, Disney is now confidently pursuing a path to revive their most treasured animated classics as modern live action retellings. Plans for live action updates of The Little Mermaid, Aladdin, and The Lion King among others are in place for the near future - some love the idea (including myself), others feel Disney is milking their most acclaimed hits for easy profits. Whatever your stance, it's hard to deny Disney have done a great job with their efforts thus far, and this only continues (for the most part) with an adaptation of arguably their most beloved hit to date - Beauty and the Beast. After years of selfishness and neglect to those who care about him, a young Prince (Dan Stevens) is transformed into a hideous beast by a mysterious enchantress - his only hope for redemption lies within a magical rose, which wilts over time, and the task of him having to learn to love another and earn their love in return before the last petal falls. His chance finally comes with the arrival of adventurous farmgirl Belle (Emma Watson), who takes her father Maurice's (Kevin Kline) place as prisoner after he trespasses at the Beast's castle. 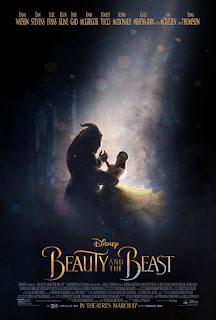 As time goes on, the bond between Belle and the Beast accels beyond hatred and blossoms into friendship, leading to hope after all for the Beast's redemption and his return to humanity. The key thing most people displayed concern over with this movie was Emma Watson in the lead role - influenced by some obvious autotune on her singing voice and generally bland delivery witnessed within the film's many trailers. Such a concern I myself highlighted in anticipation for the film, and while Watson does her best, it can't help but feel evident that she was simply miscast - she's as beautiful as ever and so suits the role in that respect, but her acting often finds itself stuck in eternal blandness and her singing sounds grossly electronic, occasionally ruining what are otherwise superb reimaginings of the animated classic's most cherished songs. These traits can't be said for the rest of the cast, however; Dan Stevens finds himself mastering the role of the Beast, a character just as well crafted from a visual perspective with some superb effects used to morph Stevens into an excellent live action adaptation of the character. In terms of supporting roles, the beloved servants of the castle Lumiere (Ewan McGregor), Cogsworth (Ian McKellen), and Mrs. Potts (Emma Thompson) find themselves with the perfect actors for their roles and are just as well designed as the Beast - the CGI effects are breathtakingly realistic and the animation anything but perfect. The role of Gaston, taken on by Luke Evans, isn't as memorable as the portrayal by Richard White in the animated original, though Evans does his best with somewhat weaker material and is arguably perfect for the role. At nearly 2 hours in run time as opposed to the original's circa 80 minutes, Beauty and the Beast of course injects more narrative threads into the mix - some work, some don't. 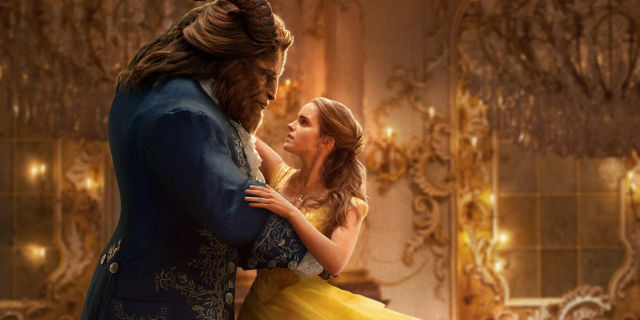 It's interesting to see a somewhat stronger focus on the Beast's past, and it's admirable to see a strong attention to detail to address unexplained if minor concerns from the animated original, though sometimes these drag out to unwanted levels and can make the film feel somewhat bloated as it nears it's undoubtedly disappointing climax. When it comes to the main chemistry between Watson and Stevens, it's arguably touching to see their bond develop from start to finish, even if some of these aforementioned new plot threads can sometimes drag out basic exposition. Referring back to Watson, one of course has to respect the difficulty the role must have considering her interactions with many CGI characters, though such roles have been taken on by many acclaimed actors and mastered with much practice - Watson too often feels bland and boring to watch, which is a shame considering her overall talent and potential. Aesthetically, the film is just what a live action reimagining should look like - dark and stylish, with perfect attention to detail in almost every respect. The songs are equally as enjoyable (if at times ruined by some fairly obvious autotune) and Alan Menken's score is a beautiful modern update; yes, the film sometimes lacks the heart and innovation of the 1991 classic, but it's still a strong retelling that stays loyal to it's basis and one that most fans will enjoy.